Thank heavens I can use the word ‘feline’ as it makes a nice title. Fables are stories that teach a moral. They were often used in the middle ages (5th – 15th centuries of European history). They sometimes feature anthropomorphized cats. Cats were employed in fables to show intelligent and mischievous behavior. That is interesting because it tells us that hundreds of years ago the semi-domesticated cat as it was at the time was seen as a slightly cunning creature. I am not sure that is good for the cat, actually. 1. Caxton (the man accredited with the introduction of the printing press to England) in 1484 wrote: “The devil plays with a sinner, like a cat does with a mouse“. 2. In Winchester Cathedral there are many wonderful carvings in the choir stalls. Apparently these were made in 1308 or thereabouts (src: Flickr photographer Rex Harris). In one carving a cat is preaching to a congregation of mice. In the next carving the cat has pounced on them! The moral would seem to be to avoid being lulled into a false sense of security. 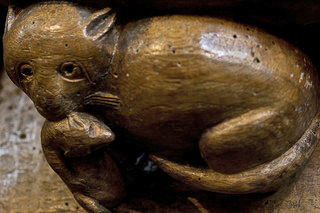 The picture above is from the carvings and shows a mouse in the mouth of a cat. I am not sure is this is the carving I am writing about. The photo is by Amanda. 3. In Spain, Tarragona Cathedral a similar fable exists using a different scenario. A ‘dead’ cat on a funeral stand is being carried by mice. The cat is pretending to be dead. He wakes up and pounces. In this example the cat represents the devil and the mice men. This was the time when people connected the cat to the devil – witchcraft. 4. Odo of Cheriton a preacher of the 13th century tells the moral that we should not believe a promise that has been extracted from someone under duress. A mouse is stuck in a beer mug with slippery sides. It can’t get out. The cat promises to help provided the mouse agrees to come to him when he calls. The mouse promises and is rescued. Later the cat calls but the mouse does not come. The mouse says she was drunk and that her promise was made under pressure from the cat. 5. The Cat and the Cockerel. A cat is thinking about eating a cockerel. The cat wants to justify eating the cockerel and tells the cockerel that he is a nuisance because of the noise he makes. The cockerel defends himself by arguing that he gets the farmer up! The cat eats the cockerel nonetheless because he has to eat. Full stop. Moral: you don’t need to justify your actions sometimes. 6. You may have heard of this one from several hundred years ago. A group of mice are being terrorized by a cat. They try and work out a way to stop the cat. At a meeting they decide to put a bell around the cat’s neck to warn them of the cat’s arrival. The wise mouse amongst them asks, “who is going to put the bell around the cat’s neck”. Moral: make sure your plan can be carried out.